We didn’t get a lot of geese, but if there was a limit on laughter we’d be way over the max. — Mark Davis, Outdoor Writer and Photojournalist for the Omaha World-Herald, reflecting on a recent Canada goose hunt. The camaraderie part of hunting is big. Your companions can make or break a hunt. The choices you make in whom you share a blind with will ultimately determine your level of satisfaction. Trust me, it only takes one jerk to ruin a hunting trip. I’ve been there and maybe you have, too. I think the folks you share the field with are actually more important than the amount of game birds or animals you see. Because of what I do as a profession (Public Information Officer for the Nebraska Game and Parks Commission) I am very careful to try to pick the people I spend time with hunting. 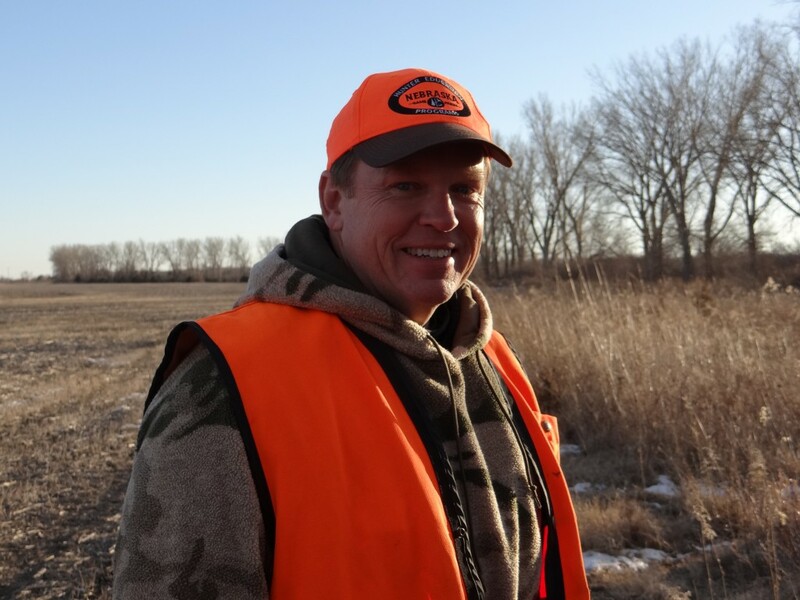 One of my hunting partners is NE Conservation Officer Rich Berggren of Waterloo. 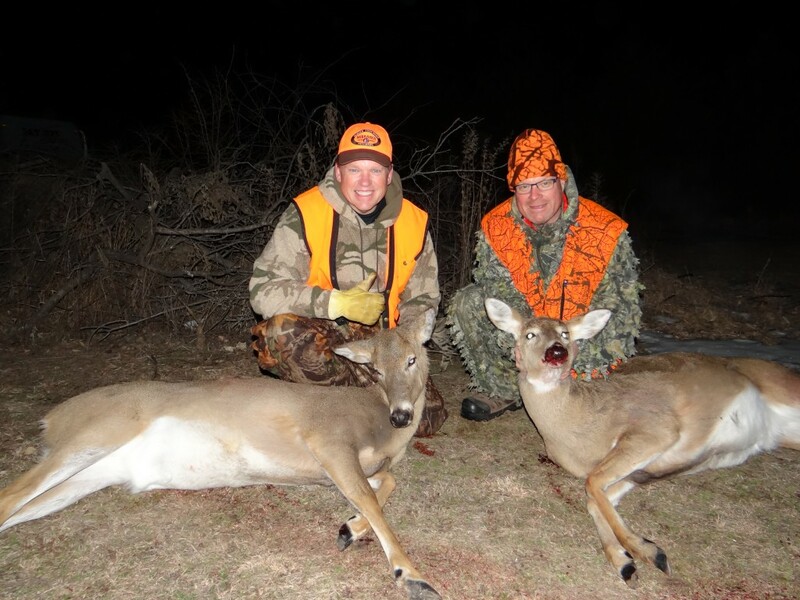 Rich Berggren and I with our whitetail does after a 2015 late firearm season antlerless deer hunt. Please know that I’m not special, and I do not believe than I’m better than anyone else, but I value my day job! I cannot afford nor do I want to deal with guilt by association! There’s much to wisely selecting a hunting partner or partners. A thorough knowledge of and strict adherence to game laws and regulations, a complete grasp of firearm safety, a passion for what is being sought, a sense of humor, a willingness to share the load, a belief in sound hunter ethics (manners), an understanding of wildlife conservation, a positive outlook no matter what the situation – those are some of the characteristics of a good hunting partner in my book. High quality hunting partners are also always willing to try new things. 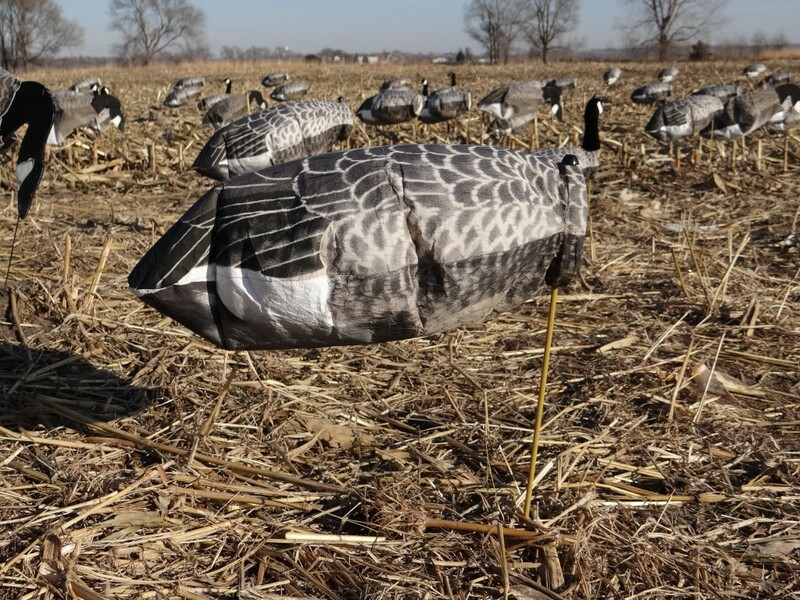 A hunting buddy removed the heads off of some of the Canada goose windsock decoys in his spread to check the effect on incoming geese. The best way to find a decent hunting partner is kind of like securing a reliable hunting guide or outfitter — via references. Ask around. Talk to the local conservation officer. Talk to the landowner. Ask the clerk at the nearby convenience store. Have any of your other hunting partners hunted with him or her before? Do they know someone who did? How satisfied were they of their experience afterwards? You’re going to be spending a lot of time with this person or group so get to know them. Call and talk to them. Text them. Drop them an email message. “Friend them” on Facebook. Connect with them on Twitter or other online social networking sites. Get together with them in advance for a cup of coffee, if possible. The right folks can be the difference between a marvelous memory or a horrible hunt. Acquaintances are many, but friends are few. Choose your hunting partners wisely.